Is there an old or outgrown car seat taking up space in your garage or spare room? If so, Toys “R” Us wants to take it off your hands. In exchange for your old, potentially unsafe car seat, the toy retailer wants to offer you a 25% discount on a new car seat. The trade-in event kicks off during the month of September and continues through Sunday, October 2. Parents and caregivers can bring their old car seats to any Babies “R” Us or Toys “R” Us location. Fittingly, the Toys “R” Us Great Trade-In Car Seat Event coincides with Baby Safety Month. By encouraging parents to get rid of their outdated or second-hand car seats, Toys “R” Us hopes to spotlight one of the many ways parents can be proactive when it comes to matters of their children's safety. Even parents without an old car seat can receive a discount on a newer, safer car seat. Throughout the duration of the event, a 15% off coupon can be used in stores or online with promo code SEP15OFF. The coupon, as well as more details about the trade-in event, can be found here. When your little one is in the backseat of your car, their safety is of the utmost importance. Here’s what you can do to ensure your precious cargo is as safe as possible in their car seat. Keep straps snug. In the event of a crash, loose straps won’t be as effective as snug straps at keeping kids secure. This video can teach you how to tell if straps are snug enough. Keep kids rear-facing for as long as possible. 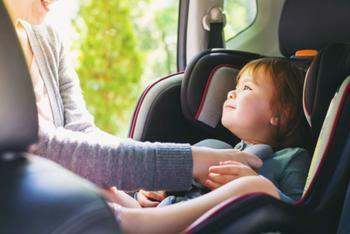 Experts say kids should be rear facing until at least age 2 or until they reach the limits of their rear-facing car seat. Keep them safe when forward-facing. For kids' safety, always use the tether strap that comes with every forward-facing car seat. Check with a professional. After you have installed your child’s car seat, verify that you’ve done it correctly by having it checked by a trained technician. Be aware that car seats expire. The plastic that car seats are made of becomes less durable with age. Take note of the expiration date listed in your car seat's manual.